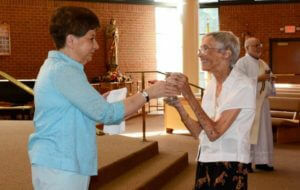 Once a week, Sister Christine Kresho meets with senior parishioners at Our Lady of Grace Church in Silver Spring, Md. Mostly in their 70s and 80s, the Spirit Companions are exploring what sister calls their “second childhood” in light of the Scripture call and its promise to grow into a time of new joy and a fuller life in God. 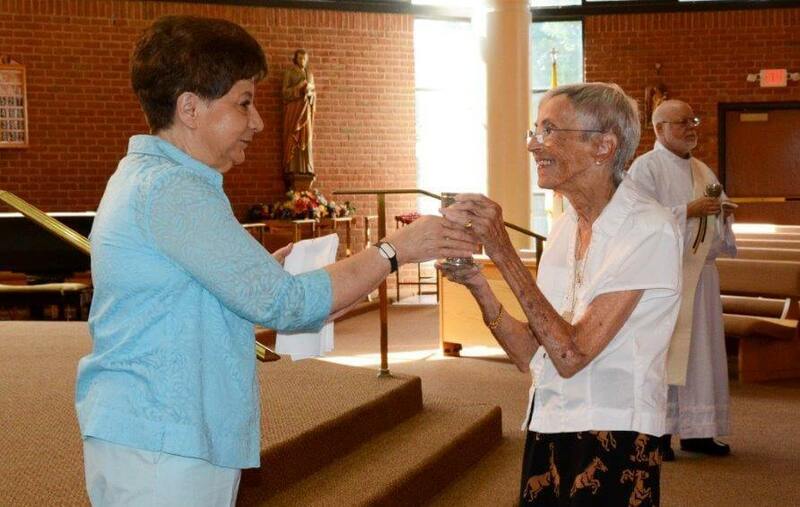 Since 2005, Sister Christine has served as Pastoral Associate at Our Lady of Grace, whose membership numbers nearly 1,000 parishioners with approximately two-thirds of them over the age of 80. She has drawn on her extensive experiences and encounters with seniors to write a new book, “Second Childhood: Aging into Divine Relationship.” The practical book covers topics such as gratitude, curiosity, desolation and stubbornness, which are paired with Scripture passages and original prayers. Q: Why is spirituality important to those who are aging? As noted by Father Richard Rohr, OFM, religion is for those who are afraid of hell; spirituality is for those who have gone through hell. In Spirit Companions, there is an underlying theme of expanding or growing in our understanding of who God is for us. I have been told often, verbally and in writing, by the participants how much it means to them; how the God they now recognize is so different from the God they knew before. Some recall a harsh male image, but now they welcome God as a Father whose strength pulls them out of an abyss, but also a Mother who hugs them when they cry. Q: What forms can spiritualty take for older adults? As one experiences more loss, sickness and diminishment in their lives, intercessory prayer becomes an important channel of spirituality for many. Many women tell me that they talk to their deceased husbands. Some reach out prayerfully to parents, other loved ones and friends who have passed away. The Communion of Saints complements and supports all they believe about a better place, being with other loved ones, and eternal happiness. Just as our aging Sisters receive life from praying for the needs of others, so do other seniors. Seniors, though, may approach intercessory prayer differently, depending on their image of God. Some envision God as a “far-away” image who answers prayers based on the number that are said or the “goodness” of the person reciting them. Others see a God who loves them unconditionally, who walks with them, celebrates with them, cries with them and understands them through all circumstances. Q: How can one help cultivate a healthy spirituality for older persons? There is not one way. Senior adults are very aware that they deserve respect for having aged in wisdom. Engage in conversation and listen. Some are comfortable and need the security of the image of God that they have held on to for years. Others are still seeking, and open to changing their image of God. It is always good to remember that even when we think we are seekers, it is always God who searches for us. It is God who arouses, stirs, and encourages us to pursue our Creator who is not only waiting to be found, but is at the same time seeking for us. Q. What are some simple ways that a family member can identify, and, thus, perhaps, address spiritual needs of an aging loved one? Talk, listen and ask. Help them stay connected. The yearning for connection, the attraction to unity, is built into the universe story as well as our DNA. Moments of connection in personal lives warm our hearts; stories of connection between people, among nations, and all of creation, tells us that all of life is relational. Q: What are the blessings that come from God in the aging process that arrive alongside the sometimes difficult experiences of illness, isolation, or grief? It’s a time for “wings.” In the first half of life, they grew their roots in the faith. Now they can come to know God in a different way and relax into their Creator’s embrace with trust. Life has shown them that God will never leave them. Sister Christine’s book, “Second Childhood: Aging into Divine Relationship,” can be purchased for $12.00 plus tax and postage through the Sisters of St. Joseph gift shop by calling 724-869-6549. (This article originally appeared in the Pittsburgh Catholic Senior Life and Resource Guide 2017-18).